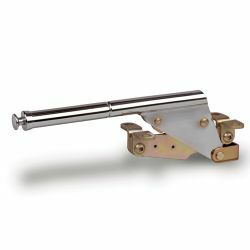 This 10 inch floor mount emergency hand brake is chromed steel and designed after the auto industry specifications. See Related Products for complete kit! This 10 inch floor mount emergency hand brake is chromed steel and designed after the auto industry specifications. Comes complete with clevis and cables for installation.